Find answers to all your wood floor questions, if you can't find your answer here please get in touch. We have worked for commercial and domestic clients including community centres, pubs, church halls, restaurants, schools and town halls. 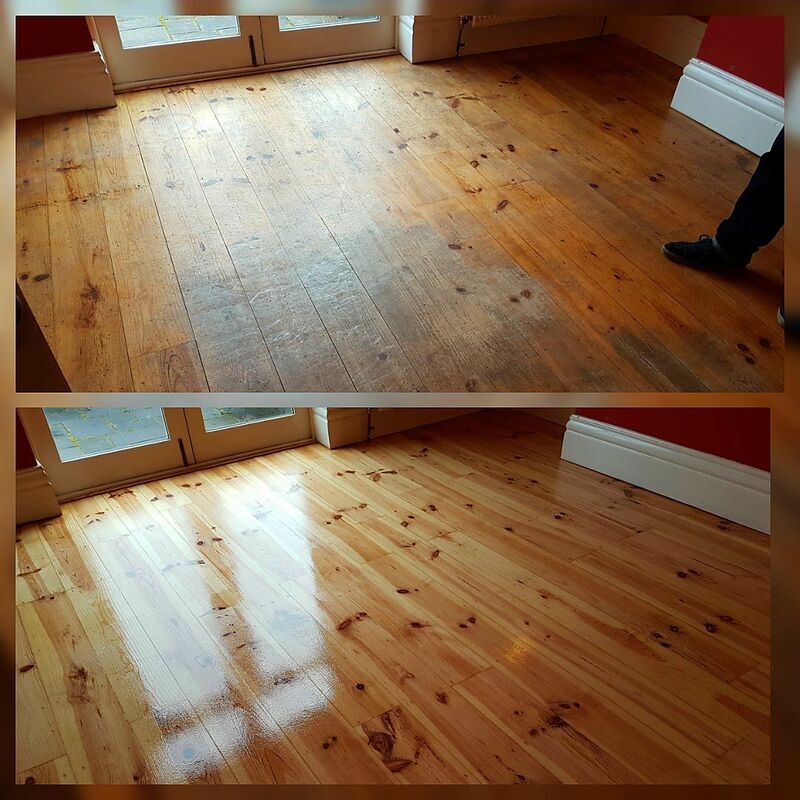 Whether you have parquet, natural or engineered hardwood or pine floorboards we can restore and seal them to keep them looking beautiful for years. We use specialist equipment and never cut corners. Our outstanding testimonials prove what a great service we provide – look at our Facebook page for our latest projects. 1. The sanding process, what’s involved? To get the floor as smooth and clean as possible is the ultimate goal, while at the same time removing as little wood as possible to preserve the longevity of the floor. Our initial procedure is a pre-vacuum. We usually start sanding using coarse grit with the commercial sanding machine and edging machines. This removes years of old finishes (or whatever else may be on the floor), scratches and dents to reveal a smooth, flat clean floor. We usually find most stains are not embedded deeply and therefore come out in the sanding process, but sometimes others soak right through into the wood. Moving on to medium grit with the sander and edging sander, which removes the scratches caused by previous coarse grit sanding. Sometimes we start with a medium grit, depending how bad the floor is. Finally the finishing sander is used to eliminate all the scratches from the previous steps. 2. Is there a lot of Dust? If you have rented sanding machines then you would be rightly concerned most about dust. Cheap rental sanding machines create a vast amount of dust, often getting everywhere no matter how careful you be (they are also not the best machines, so don’t do a very good job at sanding your floor). The latest specialist floor sanding machines that we use are superior, removing over 95% of the dust created. In conjunction, we also use a high-quality M class filtering dust extraction system. Please note there will always be a small amount of dust so we recommend covering any items that are valuable. 3. Can you stain my wooden floor a different colour? Staining or applying a colour before applying the protective coatings can be done (at an additional cost). Some clients say they would like their wooden floors sanding and staining when they mean sanding and refinishing. Clear seal/lacquers will give a slight darkening to the wood and therefore bring out its natural grain. If you would like to darken (or even lighten) the floor, we have samples to choose from. Pine and oak lend themselves to staining as they are light in colour and present a blank canvas on which to create a beautiful finish of your own. 4. Can my floor be saved? The majority of the time we can restore your floor to its former glory. If you think your floor is beyond repair, don't despair! Give us a call and we'll give you an honest opinion. It's not recommended to stain the more colourful or exotic woods as the natural unstained grain is so much more beautiful and are already more full-bodied in colour. 5. How long to complete the restoration process? In commercial premises, we need to do a survey before it's possible to give you any indication of how long the whole process will take as the variables involved are numerous. When you book us we will work with you to ensure as little disruption to your business as possible. For the average home with 2 reception rooms, hallway and between two to four bedrooms it will take between 3-5 days if we assume the floors are in a fairly good condition and the finish chosen is natural with no staining to be done. Single rooms of a standard size are normally finished in one or two days. Occasionally, circumstances out of our control can cause the lacquers to dry slowly, or even repairs done in the morning may set the job back a little. If this is the case we will apply the final coat the next day. If the floor is being stained as well this could add an extra day on to the process. Since stairs have to be sanded with hand sanders that are not as powerful as floor sanders or don’t carry the same weight, it usually takes a lot longer, especially if there are numerous coats of thick paint on them (which is often the case). Allow the minimum 3 days for stairs to be completed. 6. Should the decorating be done before or after refinishing my wooden floors? Generally speaking this can be done before we sand the floors. Although in some circumstances, it's recommend skirting boards should be painted after we have restored the flooring. This is because the edging sander can lightly rub up against the skirting leaving a vary faint line at the base. Gloss paint can sometimes take a considerable amount of time to cure and may delaminate or chip off, which causes a problem when applying lacquers to the finished floor as the paint can flake and fall in the wet floor lacquers. 7. What geographical areas do we cover? We predominantly cover York, Beverley, Driffield and the surrounding areas. However, if your wooden flooring is a sizeable and/or interesting project outside of this area please don’t hesitate to call us as we will consider taking the job on. 8.What is the lead or waiting time for work to book in? It does vary from year to year, but our lead time can be up to a few weeks. Rest assured that it will be worth the wait!